The March 2017 Fandom in a Bag swap is Winnie-the-Pooh. Step 1: Step 1: Please list in the comments your favorite characters, stories, moments, or any other preference you may have. Step 2: After partners are assigned, check to see what your partner likes. You can follow-up with a message if you need to know more. Then scrounge up, buy, and/or create items that fit in a bag. Your bag must contain at least 7 different types of items although more is certainly encouraged (PLEASE try to make it look full). Different types of items means 5 ATCs, 3 pins, 2 postcards would be 10 items but only 3 different types. The swap requirement is for 7 different types in a bag. Some ideas of themed items: stickers, ATCs, postcards, toys/action figures, comics, note cards, pins/buttons, magnets, jewelry, trading cards, legal music CDs, charms, ornaments, books, bookmarks, address labels, postcards, plushies/stuffies, promo stills/autograph cards, fainfic, zines, etc. More specific ideas: Hundred Acre Woods map, honey, balloons, versions of the books/stories, character hats, etc. Be sure to check your partner's profile so you don't send anything he or she might be allergic to. Step 3: Put the items in a ziplock-type bag. Size: 1 gallon (measures about 10 inches by 11 inches or 28cm by 26.5 cm). You can decorate the bag or incorporate the bag into something (mount it or sew something around it). If you want to make or buy a bag instead of using a ziplock plastic one, that's fine as well, but it should be at least a gallon in size. All items you gather or create should fit into the bag (if a couple are too big, that's fine). Assemble your bags during the month and please send by the deadline (March 31). Group rating rules apply. NO FLAKING ALLOWED! Flakers will be fed to heffalumps and woozles! 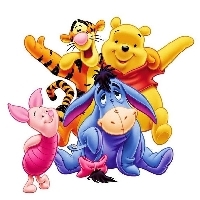 Tigger, Eeyore, owl, rabbit and the gopher are my top faves. Love the art work in the Disney versions and the classic version. I love poor, poor Eeyore, crotchety old Rabbit, and sweet little Piglet. And I'm particularly fond of Pooh. I like the original Disney versions, both for the artwork, and also when I hear the voice of Sterling Holloway! I love maps of the Hundred Aker Wood, and anything Christopher Robin has written down. Love the original stories. And my absolute favorite is the original E. H. Shepard illustrations. Anything fun and unusual, anything handmade, well, just about anything. But you should know I don't wear much jewelry other than the occasional pin. Whoops! Sent this yesterday and then forgot to mark it sent on the site! Sorry about that!